Lake Urmia (Persian: دریاچه ارومیه‎‎, Daryāche-ye Orūmiye; Azerbaijani: اورمیا ﮔﺆﻟﻮ, Urmiya gölü) is an endorheic salt lake in Iranian Azerbaijan, Iran and near Iran's border with Turkey. The lake is between the provinces of East Azerbaijan and West Azerbaijan in Iran, and west of the southern portion of the Caspian Sea. At its full size, it was the largest lake in the Middle East and the sixth-largest saltwater lake on Earth with a surface area of approximately 5,200 km² (2,000 mile²), 140 km (87 mi) length, 55 km (34 mi) width, and 16 m (52 ft) depth. The lake has shrunk to 10% of its former size due to damming of the rivers that flow into it and pumping of groundwater from the area. 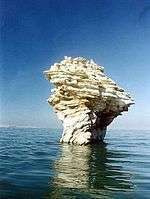 Lake Urmia, along with its once approximately 102 islands, are protected as a national park by the Iranian Department of Environment. Currently, the lake is named after the provincial capital city of Urmia, originally an Assyrian name meaning Puddle of water. However, in the early 1930s, it was called Lake Rezaiyeh (Persian: دریاچه رضائیه‎‎) after Reza Shah Pahlavi. After the Iranian Revolution in the late 1970s the lake was renamed Urmia. Its Old Persian name was Chichast (meaning, "glittering"–a reference to the glittering mineral particles suspended in the lake water and found along its shores). In medieval times it came to be known as Lake Kabuda (Kabodan), from the word for "azure" in Persian, or 'կապույտ' (kapuyt) in Armenian. Its Latin name was Lacus Matianus so it is referred to in some texts as Lake Matianus or Lake Matiene. Locally, the lake is referred to in Persian as دریاچه ارومیه, Daryāche-ye Orūmiye; in Azerbaijani as Urmu gölü, ﺍﻭﺭﻣﻮ ﮔﺆﻟﻮ, and in Kurdish as Wermy. The traditional Armenian name is Կապուտան ծով, Kaputan tsov, literally "blue sea". One of the early mentions of Lake Urmia is from the Assyrian records from 9th century BC. There, in the records of Shalmaneser III (reign 858–824 BC), two names are mentioned in the area of Lake Urmia: Parsuwash (i.e. the Persians) and Matai (i.e. the Mitanni). It is not completely clear whether these referred to places or tribes or what their relationship was to the subsequent list of personal names and "kings". But Matais were Medes and linguistically the name Parsuwash matches the Old Persian word pārsa, an Achaemenid ethnolinguistic designation. The lake was the center of the Mannaean Kingdom. A potential Mannaean settlement, represented by the ruin mound of Hasanlu, was on the south side of the lake. Mannae was overrun by the people who were called Matiani or Matieni, an Iranian people variously identified as Scythian, Saka, Sarmatian, or Cimmerian. It is not clear whether the lake took its name from the people or the people from the lake, but the country came to be called Matiene or Matiane, and gave the lake its Latin name. In the last five hundred years the area around Lake Urmia has been home to Iranians, Assyrians, and Armenians. 3 are the main anions. The Na+ and Cl− concentration is roughly four times the concentration of natural seawater. Sodium ions are at slightly higher concentration in the south compared to the north of the lake, which could result from the shallower depth in the south, and a higher net evaporation rate. The lake is divided into north and south, separated by a causeway in which a 1.5-kilometre (0.93 mi) gap provides little exchange of water between the two parts. Due to drought and increased demands for agricultural water in the lake's basin, the salinity of the lake has risen to more than 300 g/litre during recent years, and large areas of the lake bed have been desiccated. A palynological investigation on long cores from Lake Urmia has revealed a nearly 200 kyr record of vegetation and lake level changes. The vegetation has changed from the Artemisia/grass steppes during the glacial/stadial periods to oak-juniper steppe-forests during the interglacial/interstadial periods. The lake seems to have had a complex hydrological history and its water levels have greatly fluctuated in the geological history. Very high lake levels have been suggested for some time intervals during the two last glacial periods as well as during both the Last Interglacial as well as the Holocene. Lowest lake levels have occurred during the last glacial periods. Based on last checklists of biodiversity of Urmai Lake in 2014 and 2016, it is home of 62 species of Archaebacteria and Bacteria, 42 species of Microfungi, 20 species of Phytoplankton, 311 species of Plants, 5 species of Mollusca (In rivers of islands), 226 species of Birds, 27 species of Amphibians and Reptiles and 24 species of Mammals. As well as, 47 fossils have been recorded in this habitat. It is an internationally registered protected area as both a UNESCO Biosphere Reserve and a Ramsar site. The Iranian Dept. of Environment has designated most of the lake as a National Park. The lake is marked by more than a hundred small, rocky islands, which serve as stopover points during the migrations of several wild birds including flamingos, pelicans, spoonbills, ibises, storks, shelducks, avocets, stilts, and gulls. A recent drought has significantly decreased the annual amount of water the lake receives. This in turn has increased the salinity of the lake's water, lowering the lake viability as home to thousands of migratory birds including the large flamingo populations. The salinity has particularly increased in the half of the lake north of the causeway. By virtue of its high salinity, the lake no longer sustains any fish species. 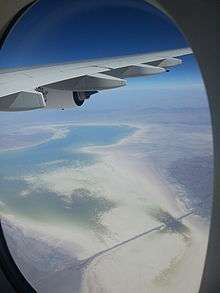 Nonetheless, Lake Urmia is considered a significant natural habitat of Artemia, which serve as food source for the migratory birds such as flamingos. In early 2013, the then-head of the Iranian Artemia Research Center was quoted that Artemia Urmiana had gone extinct due to the drastic increases in salinity. However this assessment has been contradicted. The lake is a major barrier between two of the most important cities in West Azerbaijan and East Azerbaijan provinces, Urmia and Tabriz. A project to build a highway across the lake was initiated in the 1970s but was abandoned after the Iranian Revolution of 1979, having finished a 15 km causeway with an unbridged gap. The project was revived in the early 2000s, and was completed in November 2008 with the opening of the 1.5 km Urmia Lake Bridge across the remaining gap. The highly saline environment is already heavily rusting the steel on the bridge despite anti-corrosion treatment. Experts have warned that the construction of the causeway and bridge, together with a series of ecological factors, will eventually lead to the drying up of the lake, turning it into a salt marsh which will directly affect the climate of the region. Lake Urmia has been shrinking for a long time, with an annual evaporation rate of 0.6 to 1 m (24 to 39 in). Although measures are now being taken to reverse the trend the lake has shrunk by 60% and could disappear entirely. Only 5% of the lake's water remains. On 2 August 2012, Mohammad-Javad Mohammadizadeh, the head of Iran's Environment Protection Organization, announced that Armenia has agreed on transferring water from Armenia to counter the critical fall in Lake Urmia's water levels, remarking that "hot weather and a lack of precipitation have brought the lake to its lowest water levels ever recorded". He added that recovery plans for the lake include the transfer of water from Eastern Azerbaijan Province. Previously, Iranian authorities had announced a plan to transfer water from the Aras River, which borders Iran and Azerbaijan; the 950-billion-toman plan was abandoned due to Azerbaijan's objections. In July 2014, Iran President Hassan Rouhani approved plans for a 14 trillion rial program (over $500 million) in the first year of a recovery plan. The money is supposed to be used for water management, reducing farmer's water use, and environmental restoration. Several months earlier, in March 2014, Iran's Department of Environment and the United Nations Development Programme (UNDP) issued a plan to save the lake and the nearby wetland, which called for spending $225 million in the first year and $1.3 billion overall for restoration. The Silveh Dam in Piranshahr County should be complete in 2015. Through a tunnel and canals it will transfer up to 121,700,000 m3 (98,700 acre·ft) of water from the Lavin River in the Little Zab basin to Lake Urmia basin annually. In 2015, president Hassan Rouhani’s cabinet approved $660 million for better irrigation systems and steps to combat desertification. The prospect that Lake Urmia may dry up entirely has drawn protests in Iran and abroad, directed at both the regional and national governments. Protests flared in late August 2011 after the Iranian parliament voted not to provide funds to channel water from the Araz River to raise the lake level. Apparently, parliament proposed instead to relocate people living around Lake Urmia. More than 30 activists were detained on 24 August 2011 during an iftar meal. On 25 August, several soccer fans were detained before and after the Tabriz derby match between Tractor Sazi F.C. and Shahrdari Tabriz F.C.. for shouting slogans in favor of protecting the lake, including "Lake Urmia is dying, the Majlis [parliament] orders its execution". In the absence of a right to protest publicly in Iran, protesters have incorporated their messages into chants at football matches. Further demonstrations took place in the streets of Tabriz and Urmia on 27 August and 3 September 2011. Amateur video from these events showed riot police on motorcycles attacking apparently peaceful protesters. According to the governor of West Azerbaijan, at least 60 supporters of the lake were arrested in Urmia and dozens in Tabriz because they had not applied for a permit to organize a demonstration. On May 5, 2016, Leonardo Di Caprio posted a photo of "a dilapidated ship dock remains on dried up Lake Urmia" on his Instagram page stating: "It used to be the biggest salt lake in the Middle East, but it now contains five percent of the amount of water it did two decades ago due to climate change, dam construction and decrease in precipitiation." 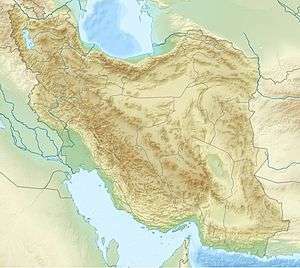 Lake Urmia had approximately 102 islands. Shahi Island was historically the lake's largest island. However, it has become a peninsula connected to the eastern shore when the lake level dropped below a certain level. Shahi Island is the burial place of both Hulagu Khan (one of Genghis Khan's grandsons) and of Hulagu's son Abaqa. Both khans were buried in a castle above 1,000-foot (300 m) the cliffs along the shore of Shahi Island. In 1967, the Iranian Department of Environment sent a team of scientists to study the ecology of Shahi Island. Various results of the study which included the breeding habits of brine shrimp were published by Javad Hashemi in the scientific journal, Iranian Scientific Sokhan. Lake Urmia is fed by 13 permanent rivers and many small springs, as well as rainfall directly into the lake. Nearly half the inflow comes from the Zarrineh River and Simineh River. There is no outflow from the lake so all water is lost through evaporation. Lake Urmia was the setting of the fictional Iranian film The White Meadows (2009), which featured fantastic-looking lands adjacent to a salt sea. There are many popular songs about Lake Urmia in Azeri Turkish such as "Urmu Golu Lay Lay"
1 2 3 4 5 Stevens, Lora R.; Djamali, Morteza; Andrieu-Ponel, Valérie; de Beaulieu, Jacques-Louis (1 April 2012). "Hydroclimatic variations over the last two glacial/interglacial cycles at Lake Urmia, Iran" (PDF). Journal of Paleolimnology. Springer Netherlands. 47 (4): 647. doi:10.1007/s10933-012-9588-3. ↑ "Saving Iran's great salt lake". Science. September 2, 2015. ↑ See, e.g. the Shahnama. ↑ "Armenian Highland". armin.am. Institute for Armenian Studies of Yerevan State University. In the Armenian Highland there are numerous lakes and ponds. The most majors are Kaputan (Urmia), Van and Sevan. ↑ Alireza Asem; Fereidun Mohebbi; Reza Ahmadi (2012). 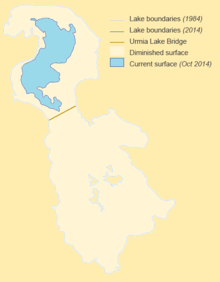 "Drought in Urmia Lake, the largest natural habitat of brine shrimp Artemia" (PDF). World aquaculture. 43: 36–38. 1 2 "UNESCO Biosphere Reserve Directory". ↑ Asem A., Eimanifar A., Djamal M., De los Rios P. and Wink M. (2014) Biodiversity of the Hypersaline Urmia Lake National Park (NW Iran), Diversity, 6: 102-132. ↑ "Iran's East and West Azarbaijan Provinces Conntected by Lake Orumiyeh Bridge". Payvand.com. Retrieved 4 September 2011. ↑ Erdbrink, Thomas (30 January 2014). "Its Great Lake Shriveled, Iran Confronts Crisis of Water Supply". New York Times. Archived from the original on 31 January 2014. ↑ "Completed by the end of the 94 dams Silveh Piranshahr" (in Persian). Kurd Press. 23 August 2014. Retrieved 20 January 2015. ↑ "Silveh Dam and Irrigation and Drainage" (in Persian). Omran Iran - Deputy Governor of West Azerbaijan. Retrieved 20 January 2015. 1 2 3 4 Mackey, Robert (30 August 2011). "Protests in Iran Over Disappearing Lake". Iran: New York Times. Retrieved 4 September 2011. 1 2 3 4 "Azeri Activists Detained In Iran For Environmental Protests". RFE/RL. 26 August 2011. Retrieved 12 November 2015. ↑ "Rally protesting Iran over Lake Urmia turns violent". Hurriyet Daily News. 1 September 2011. Retrieved 4 September 2011. ↑ "Iranian Protest Urges Help for Shrinking Lake". San Francisco Chronicle. 30 August 2011. Retrieved 4 September 2011. 1 2 3 "Iranian greens fear disaster as Lake Orumieh shrinks". The Guardian. London. 5 September 2011. ↑ "Azeri Turks in Ankara protest Lake Urmia drying up". todayszaman.com. Retrieved 4 September 2011. ↑ "Iran police break up environmental protests". euronews.net. 4 September 2011. Retrieved 4 September 2011. ↑ "Iran arrests saltwater lake protesters". BBC. 4 September 2011. Retrieved 4 September 2011. ↑ Asem, Alireza; Eimanifar, Amin; Djamali, Morteza; De los Rios, Patricio; Wink, Michael (2014). "Biodiversity of the Hypersaline Urmia Lake National Park (NW Iran)". Diversity (6): 102–132. doi:10.3390/d6020102. ↑ Boyle, John Andrew (1974). "The Thirteenth-Century Mongols' Conception of the After Life: The Evidence of their Funerary Practices". Mongolian Studies. Mongolia Society. 1: 7. ISSN 0190-3667. JSTOR 43193015. 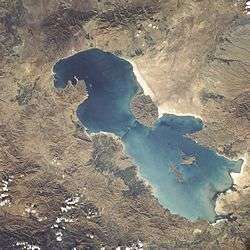 Wikimedia Commons has media related to Lake Urmia.